China's official currency is the Renminbi (literally "People's Money") and is internationally traded as the Yuan. There are 2 sub groups to the Yuan. The Jiao and the Fen. The colloquial term for Yuan is the `Kuai' and for the Jiao is `Mao'. The RMB is tied (loosely they say) to the US$ where US$1 = RMB 8.08. 1 Yuan = A$ 0.168 - say 17cents. The trick is to look at the notes so you don't mix up the Jiao and the Yuan notes (like when I tried the pay a taxi driver 12Yuan, but instead gave him 10 Yuan and 2 Jiao - he wasn't too impressed). All the Yuan notes have a picture of the man himself - Chairman Mao. So if you see Mao's smiling face looking up at you, then its a full Yuan. If no Mao its a Jiao. The other way to tell a Yuan from a Jiao is on the notes themselves. The Jiao all say Jiao on them under the number Wu Jiao (5 Jiao), Er Jiao (2 Jiao) and Yi Jiao (1 Jiao). 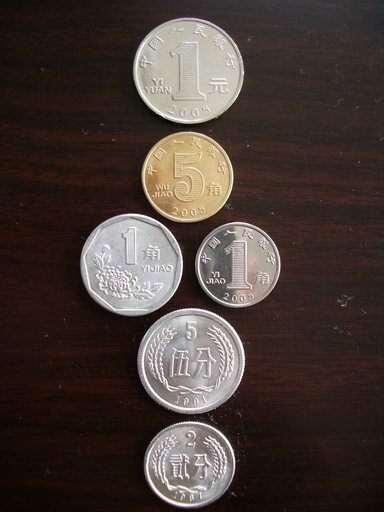 On the coins, the 1 Yuan coin is the biggest, and it says Yi Yuan (1 Yuan). The 5 Jiao coin is gold and says Wu Jiao (5 Jiao) and the 1 Jiao coin is small and silver and says Yi Jiao (1 Jiao). The Fen coins are basically worthless, but they are easy to tell as they are very tinny and have only a number on it (ie. it doesn't actually say Fen). - We were given lots of fake 20 yuans, some of the replicas are really good and dificult to spot unless you look for the ghost image on all of them, which is sometimes dificult to do, as theres not always the time to do it. - We were approached by 2 girls that were very friendly that ended up inviting us to see a tea sample. At the end the bill was more expensive that a dinner at the M on the Bund. I know this people dont care about the impression they give to tourists as long as they get inmmediate benefits, but Im thinking ahead for the Olimpics and theres going to be lots of scams and lots of dissapointed people!! Be aware! Sorry to hear about your unpleasant experience in China. I think your experience is worth highlighting on the blog as we do have many readers that actually research our site before coming to China for the first time. Would you be able to get in touch with me via email and tell me more about it? I found a 1 Yi Jiao dated 1962 with pictures of farm workers on it. Is it worth anything more than its face value? Try asking around some shops..you never know what offer you may get! hi, i have a 100 yuan... i think, its the very top bill in the pictures at teh top, the red one. and i was wondering how much it would be worth in us dollars? I lived in Wuxi, China teaching at the Guanghua school there. It took me a little while to get the hang of the money system, but once I got it I found it was a lot of fun. I liked the fact that the money is so brightly colored. It makes it a lot easier to know exactly how much you have to work with. I was lucky the 6 months I lived in China. I never had an experience with anyone scamming me or getting fake money. I think part of the key to that is looking like you know what you are doing. If people think you don't know how much stuff costs they are going to rip you off like crazy. Be smart, look smart and act smart and I think most people will be fine. I was in Shanghai for almost 3 weeks and i was fortunate enough that I was never scammed. I loved the city from Pudong to Puxi. I hate the way people SPIT everywhere though, even inside cinema houses. By the way, are yuan really traded internationally? I thought the RMB's cannot be officially traded/bought from outside China - like the rest of currencies coming from communist countries (like Vietnam, Laos, Cuba). Just a thought. Great site. Yes, that used to be the case but due to liberisation of the world's economy in recent years, the yuan is now quite easily available any where. I have a 5 dollar Wu Jiao, and I'm going to China in a few weeks. Will I be able to spend the Wu Jiao in China? I have the following money, what is it worth on 8/18/09 ? Please clarify each line. Thank you. Hi. Just wanted to say thanks for explaining the colloquial word kuai. Was wondering how that fit in. Now I can figure out the conversions. Hi, I have a 2 Er Yuan note with what looks like two western ladies on the front and a sea coast scene and 5 or 6 written scripts on the back:chinese, arabic, indian ???? Can anybody enlighten me? Where is it from? I have an Asian coin year 2006, silver in color,4 Chinese figures below 100. On Reverse is Image of man long beard, prominent hat, Chinese figures to right and left of man. What country is this coin from? What is the denomination? Anything else you can tell me about this coin will be very much appreciated. i have a yi yuan coin that has 1 on it is it a penny or what im not really sure. i got it from toco bell they thought it was a quarter. @Mary the Asian coin you refer to is the south Korean won. Worth about 9 cents USD. Hi im doing a project on the 1 yi jiao can i get some intresting info about this chinese note. hi, I have 1 yiyuan how much is this in Ghana cedis or US dollas please. I blog quite often and I truly thank you for your information. This great article has really peaked my interest. I'm going to book mark your blog and keep checking for new information about once a week. I opted in for your RSS feed too. i have been wondering i have a jiao bill but says "ER JIAO" instead of "WU JIAO" help!!!!!!! 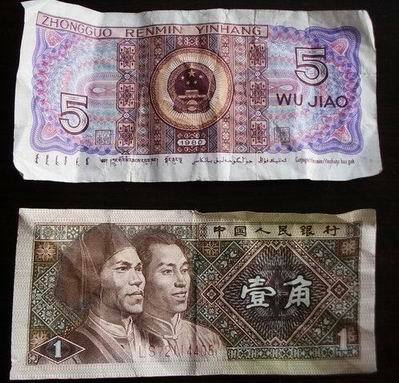 Hi,how much is 1 yi yuan and 5 wu jiao in kenyan shillings?